XYZ Spinningfields is sited on the last empty plot at the prestigious Spinningfields development in Manchester. 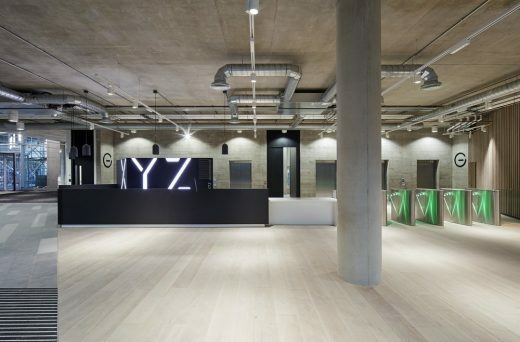 The speculative ten-storey, 22,600m2 workspace building commissioned by Allied London is specifically aimed at the fast expanding TMT (technology, media and telecommunications). 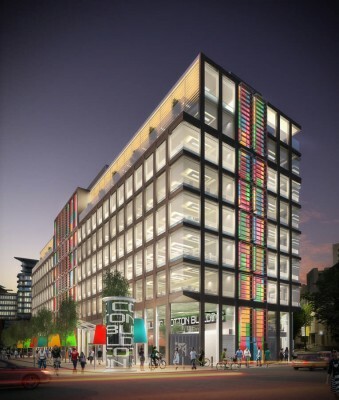 Designed initially in 2012 as a highly ‘agile’ speculative commercial office that would also act as a community hub for its perspective tenants within the extremely successful Spinningfields commercial quarter of Manchester City Centre. The original brief from Allied London was for an innovative building concept that gives tenants the ability to adapt their space quickly, easily and at low risk. The building features a unique public environment, which includes basement car parking and a bike park with dedicated entrance. 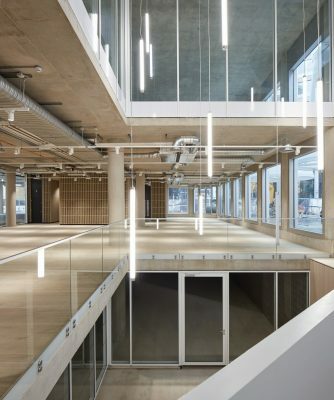 The lower floors of the building provide communal workspace, a gym, café, bar and restaurants, and a series of building and service concierges, aiming to provide essential support to tenants ranging from start-ups and small businesses to established corporates. 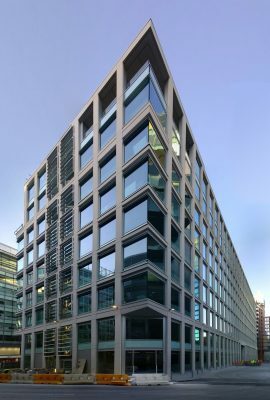 The challenge was to design and detail a building and an architectural framework that was loose enough to enable multiple servicing options and flexible occupancy densities that would be extremely attractive to the target office market (at a time when still in recession outside of London), yet create a distinctive commercial office proposition that matched Allied London’s overarching concept and brand. The building allows its tenants to adapt and develop their spaces with multiple servicing arrangements to suit tenant’s rental requirements. Each 20,000sqft floorplate can accommodate up to 2 tenants utilising any of the 3 servicing options available, ceiling mounted fan coil, active chilled beams or below floor displacement system. Multiple servicing options ensures the end product is extremely attractive to the majority of the commercial office market. This idea that the building was a framework for new working methods was explored in every aspect from product selection, material finishes, to elevational and sectional strategies. Despite a tight and restrictive site, we looked to create moments of architectural delight and drama in areas to promote impromptu social and work interaction. The main feature stair that switches back leaving double height voids between flights within an exposed concrete enclosure along with a triple height well that the main entrance bridge passes through. A bike ramp is visible from the main ground floor reception and full height digital display screen walls will define spaces. Pocket parks at the top floor and linear roof terrace at level 7 provide additional breakout and amenity. A highly repetitive and adaptable façade has been developed to enable possible suspended or exposed soffit ceilings. Micro louvre panels incorporated within window bays allow for additional on floor venting where required by future tenants. 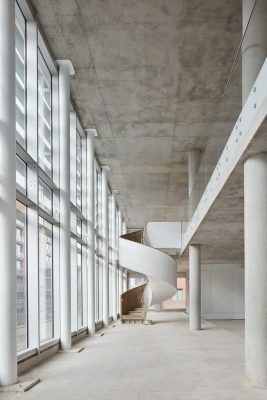 High gloss white steel balustrades and refined precast concrete stairs were chosen to contrast against the rough self-finished slip form escape core walls. Working with the client and their branding agency a specific font, graphic style, colour palate and signage strategy was created and employed from car park markings to WC door signs. All elements to reflect the XYZ brand and target market. The majority of the building is constructed from concrete, with exposed concrete columns and soffits. Exposed concrete forms the 3 stair cores and lift lobby. 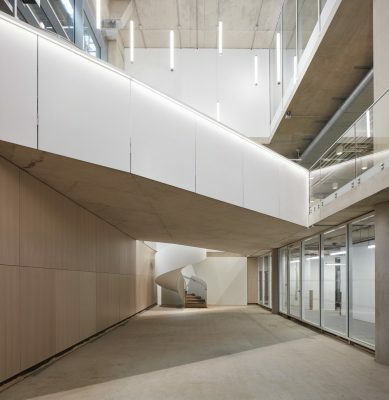 The specific decision to use concrete ensures fire and acoustic requirements are inherent to the fabric and does not rely on over-cladding or additional materials. Cost effective formwork types, whilst fully coordinated and designed to ensure a high quality of finish was maintained were employed throughout. Thermal benefits from the exposed concrete slab and the maximised floor to soffit height ensure a high-quality working environment. 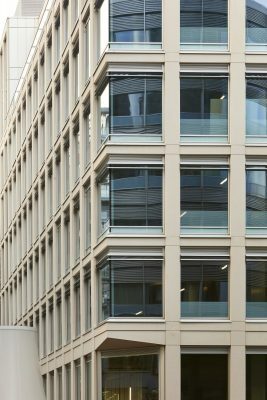 A PT slab ensured the building height was reduced by minimising the depth of a slab across all floors, therefore creating a knock-on impact on reduced cost for materials for the external envelope. 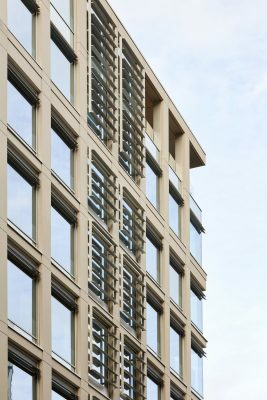 A rational façade design ensures additional cost saving benefits are made through the high repetition of precast façade components and minimises waste. The inclusion of a mezzanine floor at level 8 meant we added additional net lettable floor area without the need for the whole building to be sprinklered, as the mezzanine floor level took us over the height threshold for a sprinkler solution. The facade has also been designed to enable the multiple servicing options. A pragmatic approach to the construction budget has been employed across the whole scheme. Money has been spent on areas which make the maximum impact and money saved elsewhere without comprising the overall build quality. The building has subsequently been fully let to a mix of both TMT and professional sector clients and sold on prior to completion showing the value of both the Manchester commercial market but also the benefits of a strong client concept that was held onto until completion. 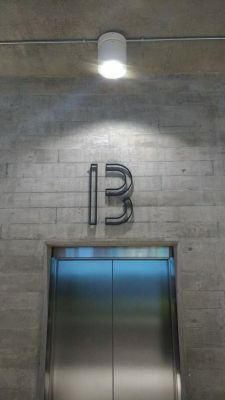 The precast concrete cladding and finish was agreed upon through samples leading to a full scale mock up prepared by Techrete for final sign off. The steel helical stairs were developed alongside Shawtons, a local architectural steelwork contractor, who manufactured the stairs off site and tack welded them together in their factory to ensure we were happy with the form and finish. For our feature core 1 stair, small scale plaster samples helped us understand the complex geometries of the curving soffits. This continuous process of reviewing, developing samples and working closely with subcontractors during the construction has been incredibly successful on the key elements of the build. Cartwright Pickard is keen to understand the materials and products uses on its buildings, how they work, what their limits are and how they are put together. At XYZ this was no different. 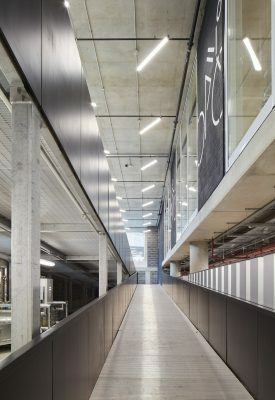 Cartwright Pickard used a relatively small palette of materials, including concrete, precast concrete cladding, anodised aluminium, glazing and painted steel plates wherever possible for internal finishes, staircases, facades and balustrades. Cartwright Pickard worked closely with Heyrod, the concrete frame subcontractor, to develop the concrete mix, junction details, panel layouts and tie hole positions to suit our architectural aspirations whilst always considering the economy of using standard board sizes and repetitive reuse of shuttering across different floors.